The November You Beauty Discovery Box has arrived and this month's edit was specifically chosen to give us as subscribers a helping hand with the celebration of Autumn and in doing so, the chance to select products which would help to enhance our hair, skin and regular beauty regime. 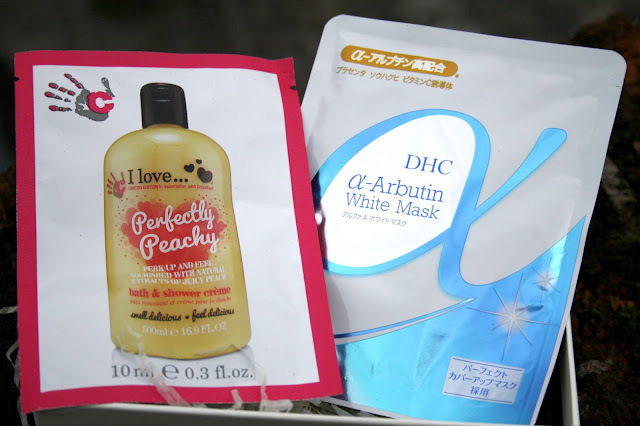 There is two treats within this box, a little extra which I really like to get and this month we have the Alpha-Arbutin White Mask by DHC. Fight dullness and discolouration with DHC Alpha-Arburtin White Mask, a sheet mask formulated with moisture-binding ingredients. The deeply conditioning formula helps target the signs of ageing and sun exposure. The revamped sheet mask contains 43% more serum than before, uniting scientifically advanced brightener, alpha-arbutin, with mulberry, serine and peony. The sheet mask’s radiance enhancing formula delivers a continuous dose of hydration to the skin, and the addition of fold-over flaps allow the option of also using the mask to treat the eye area. I Love Perfectly Peachy Bath and Shower Creme sachet. I Love… is the first cosmetics company to commit to adding breast cancer awareness signs and symptoms labels to their limited edition Perfectly Peachy Bath & Shower Crème as part of CoppaFeel!’s new #showerhijack campaign and I wrote about it HERE. Bubble T – Bath & Shower Jelly - As a brand Bubble T is one I have seen written about quite a few times and as I had never tried any of the products, I thought this would be a great opportunity. More than a shower gel, the Bath and Shower Jelly has a great malleable texture to cleanse and refresh. Ideal for the bath as the jelly won’t slip or slide off your hands. Scoop and lather! This one is the Summer Fruits Tea scent and it smells really fruity. 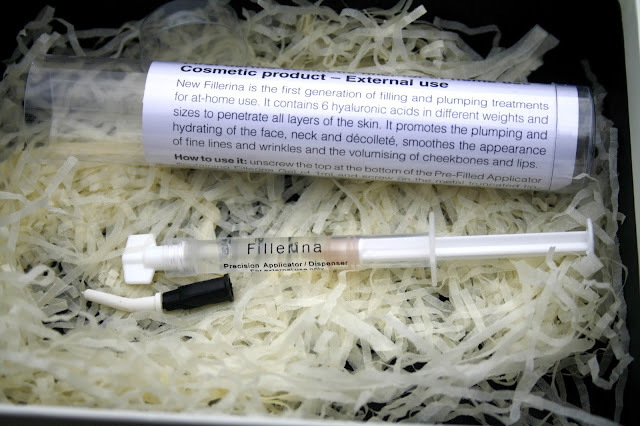 Fillerina – Hyaluronic Acid Gel Filler (grade 2). 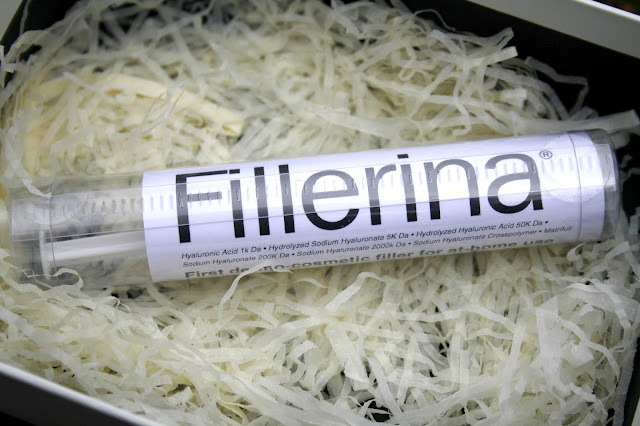 Okay so this really caught my attention with the words 'Revolutionary No Needle Filler' and it is a dermo-cosmetic filler for at-home use that containts the first ever blend of six hyaluronic acids with different weights and structures to facilitate in the plumping of tissues without puncturing the skin and I am really looking forward to giving it a try! So there you have my box of treats for this month and all for the bargain price of £6.95 and some really intriguing products to try this month. What do you think? Fillerina – Hyaluronic Acid Gel Filler sounds just the thing for my wrinkles. This Discovery Box has some really interesting items doesn't it? ooo what treats!! i love the bath jelly!! What a lovely little box of treats, love the look of the bath jelly. That Shower Jelly looks interesting! I haven't seen that before.. I'm curious about the gel filler but it still makes me feel a bit nervous looking at it! It looks very clinical even though there's no needle. Will be interested to hear your thoughts on it! This sounds really interesting! Especially the filler, be interested to hear how you get on- and such bargain price too! That's quite a bargain! I had a few trips away in autumn, so the extra sun and relaxation means winter skin/hair is only just hitting - something to add a bit of radiance is definitely needed now. I love the sound of this box and I think the price is fantastic! I love the fact that you can choose items aswell as I hate that feeling of receiving something you would never use! I love the sound of this. Do you have to subscribe for a certain length of time or can you do one off? Sounds very good value! such a good idea as a present or a treat! Some nice products to try. I keep thinking about ordering my daughetr a box for her as a monthly treat. The bath and shower jelly sounds amazing how much does it retail at? Great box. such great products!! that brightening sheet mask and the hyaluronic treatment sound amazing!!! I love Bubble T shower gel, It has the most awesome texture which appears to be a runny gel but is actually firm and foams up in the hand. genius! That is amazing value and you have some really interesting sounding products to try! I never tired bath jelly before haha but it looks amazing! Lovely treats you have here. I will check these out. That's a great price for the box, I'll have to look into this box for my teenagers although I must admit that the filler scares me a little even if there are no needles! 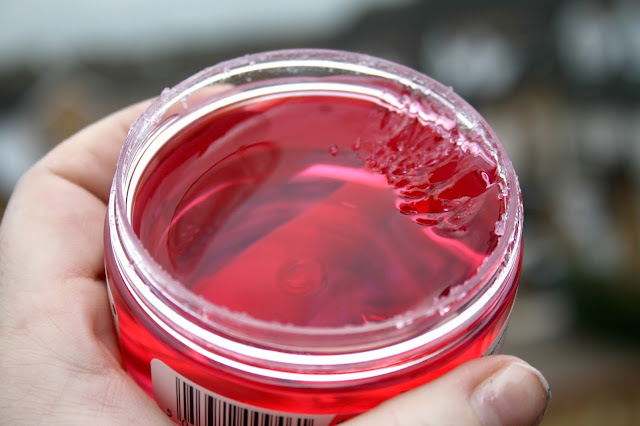 That bath and shower jelly looks exactly like Jell-O lol I've never seen anything like it! What a lovely treat box, the jelly looks interesting. I wonder if it would be good for children because I reckon my 3yo would love it! Fun box -- it's always fun to get something on a monthly basis. It's like your birthday every month! fabulous box! I am really intrigued by the shower jelly! So neat! 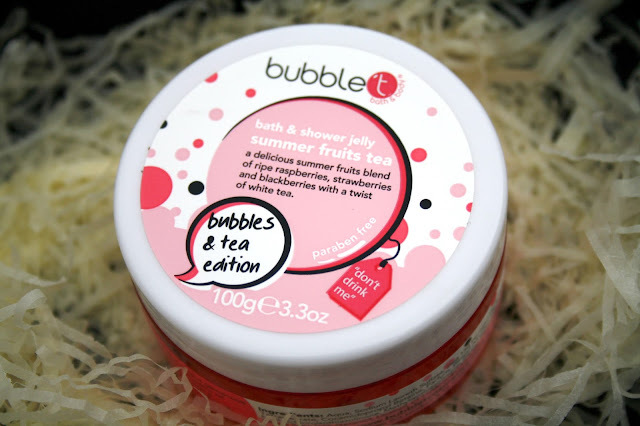 I love the sound of the Bubble T Shower Jelly although I feel like the texture would completely freak me out IRL haha!